C. Ware, “Visual Queries: The Foundation of Visual Thinking”, in Knowledge and Information Visualization: Searching for Synergies, no. S. Tergan & T. Keller, New York, NY, USA: Springer Publisher, 2005, pp. 25-33. Y. Rzhanov, Mamaenko, A., and Yoklavich, M., “UVSD: Software for Detection of Color Underwater Features”, IEEE Oceans. St. Andrews, New Brunswick, Canada, pp. 0-4, 2005. M. Quinn, “Automatic Illustration of Ocean Currents”, 2005. G. McGillicuddy, “Characterization of Weak Rope Through the Design and Construction of a Portable Tensile Testing Machine”, 2005. C. E. Parrish, Sault, M., White, S. A., and Sellars, J., “Empirical Analysis of Aerial Camera Filters for Shoreline Mapping”, American Society for Photogrammetry and Remote Sensing (ASPRS). Baltimore, MD, USA, 2005. J. Miksis-Olds, Donaghay, P. L., Miller, J. H., and Tyack, P. L., “Environmental Noise Levels Affect the Activity Budget of the Florida Manatee”, Journal of the Acoustical Society of America, 2005. T. C. Weber, Lyons, A. P., and Bradley, D. L., “An Estimate of the Gas Transfer Rate from Oceanic Bubbles Derived from Multibeam Sonar Observations of a Ship Wake”, Journal of Geophysical Research, vol. 110. American Geophysical Union, Washington, DC, pp. 1-11, 2005. M. A. Malik, “Identification of Bottom Fishing Impacted Areas Using Multibeam Sonar and Videography”, 2005. R. E. Grizzle, Ward, L. G., Adams, J. R., Dijkstra, S. J., and Smith, B., “Mapping and Characterizing Oyster Reefs using Acoustic Techniques, Underwater Videography and Quadrat Sampling”, Benthic Habitats and the Effects of Fishing, no. P.W. Barnes & J.P. Thomas. American Fisheries Society, Bethesda, MD, USA, pp. 153-159, 2005. M. Wolfson, “Multibeam Observations of Mine Scour and Burial Near Clearwater, Florida, Including a Test of the VIMS 2D Burial Model”, 2005. K. A. Natham, “A New Method for Perceptually Optimized Visualization of Two Layered Flow Fields”, 2005. J. V. Gardner, Mayer, L. A., and Armstrong, A. A., “New Views of the U.S. Continental Margins”, U.S. Hydrographic Conference (US HYDRO). San Diego, CA, USA, pp. 29-31, 2005. 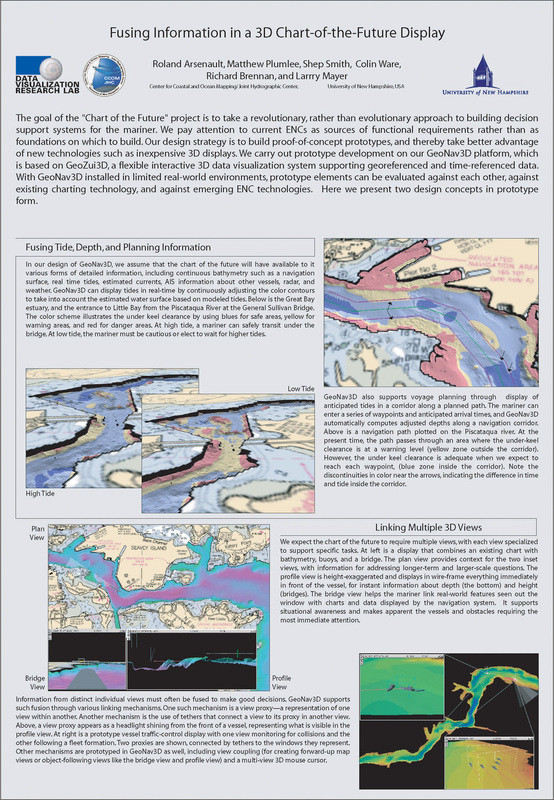 R. G. Cutter Jr., “Seafloor Habitat Characterization, Classification and Maps for the Lower Piscataqua River Estuary”, 2005. 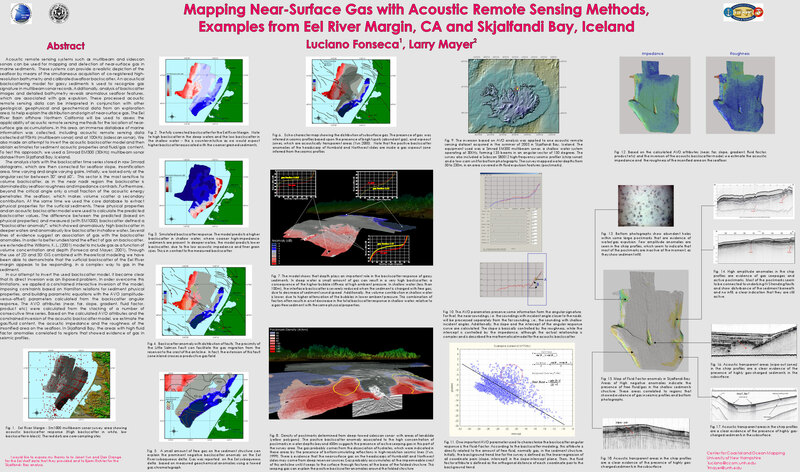 R. M. Anderson, Chayes, M., Mayer, L. A., Rognstad, M., and Schmidt, V. E., “Seafloor Sounding in Polar and Remote Regions - A New Instrument for Unattended Bathymetric Observations”, Spring Meeting - Joint Assembly EOS Transactions, American Geophysical Union. New Orleans, LA, USA, pp. 0-2, 2005. M. Sault, Parrish, C. E., White, S. A., Sellars, J., and Woolard, J., “A Sensor Fusion Approach to Coastal Mapping”, Coastal Zone Conference. New Orleans, LA, USA, 2005. C. Ware and Bobrow, R., “Supporting visual queries on medium sized node-link diagrams”, Information Visualization, vol. 4. Palgrave Macmillan, pp. 4-58, 2005. D. Cartwright and Gardner, J. V., “U.S. Law of the Sea Cruise to Map the Foot of the Slope and 2500-m Isobath of the Northeast U.S. Atlantic Continental Margin: Legs 4 and 5. Cruise Report”, University of New Hampshire (UNH), Center for Coastal and Ocean Mapping (CCOM)/Joint Hydrographic Center (JHC), 2005. J. V. Gardner and Mayer, L. A., “U.S. Law of the Sea Cruise to Map the Foot of the Slope and 2500-m Isobath of the Gulf of Alaska Continental Margin. 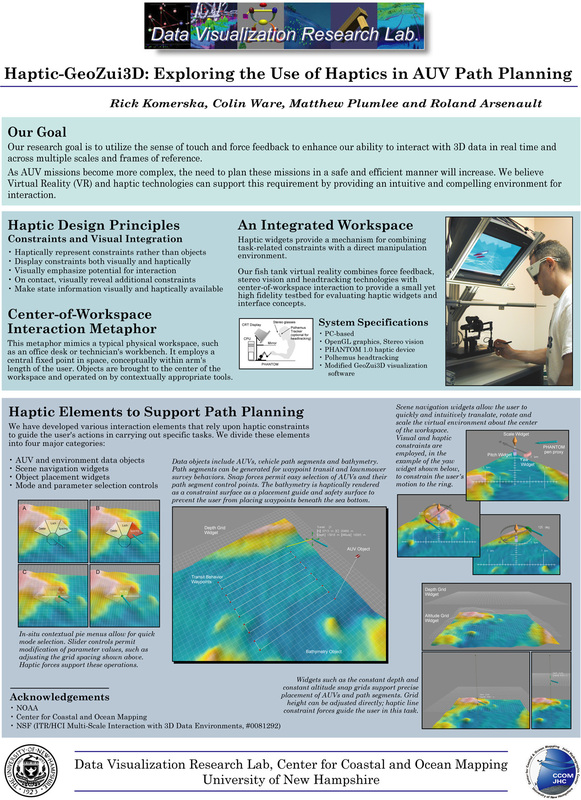 Cruise Report”, University of New Hampshire (UNH), Center for Coastal and Ocean Mapping (CCOM)/Joint Hydrographic Center (JHC), 2005. J. V. Gardner, Mayer, L. A., and Armstrong, A. A., “U.S. Law of the Sea Mapping”, Hydro International, vol. 9. Geomatics Information & Trading Center - GITC, Lemmers, Amsterdam, The Netherlands, pp. 42-45, 2005. P. Dartnell, Barnes, P., Gardner, J. V., and Lee, K., “Visualizing the Geology of Lake Trout Spawning Sites: Northern Lake Michigan”, U.S. Geological Survey (USGS), 2004. Y. Rzhanov, Mayer, L. A., and Fornair, D., “Deep-sea image processing”, IEEE Oceans. Kobe, Kobe, Japan, pp. 647-652, 2004. R. Komerska and Ware, C., “A study of Haptic Linear and Pie Menus in a 3D Fish Tank VR Environment”, International Symposium on Haptics Interfaces for Virtual Environments and Teleoperator Systems (HAPTICS). Chicago, IL, USA, pp. 224-231, 2004. C. E. Parrish, “Data Fusion - Hyperspectral, Topo Lidar and High-Resolution Imagery”, Joint Airborne LIDAR Bathymetry Technical Center of Expertise Coastal Mapping and Charting Workshop (JALBTCX). St. Petersburg Beach, FL, USA, 2004. B. P. Finney, Jaeger, J. M., Mix, A. C., Cowan, E. A., Gulick, S. P., Mayer, L. A., Pisias, N. G., Powell, R. D., Prahl, F., and Stoner, J. S., “High-resolution Holocene Records of Paleoceanographic and Paleoclimatic Variability from the Southern Alaskan Continental Margin”, EOS Transactions, American Geophysical Union . San Francisco, CA, USA, pp. 0-0, 2004. J. Mangerud, Jakobsson, M., Alexanderson, H., Astakov, V., Clarke, G., Henriksen, M., Hjort, C., Krinner, G., Lunkka, J. P., Moller, P., Murray, A., Nikolskaya, O., Saarnisto, M., and Svendsen, J. I., “Ice-dammed Lakes and Rerouting of the Drainage of Northern Eurasia during the Last Glaciation”, Journal of Quaternary Science, vol. 23. Wiley InterScience, pp. 1313-1332, 2004. T. Hou and Huff, L. C., “Seabed Characterization Using Normalized Backscatter Data by Best Estimated Grazing Angles”, International Symposium on Underwater Technology (UT). St. Andrews, New Brunswick, Canada, pp. 153-160, 2004. S. J. Dijkstra, “Robust Characterization of SHOALS Lidar Signals for Bottom Segmentation and Classification: A Combined Parameter-estimation and Curve Fitting Approach”, American Society for Photogrammetry and Remote Sensing (ASPRS). Denver, CO, USA, pp. 0-0, 2004. C. Ware and Komerska, R., “Haptic Gdraw: A fun and Easy to Use 3D Haptically Enhanced Sculpting Program”, EuroHaptics (EH). Munich, Bavaria, Germany, pp. 436-439, 2004. L. A. Mayer, Kraft, B. J., and Fonseca, L., “Measurement of In Situ Acoustic Properties for the ONR Geoclutter Program”, University of New Hampshire (UNH), Center for Coastal and Ocean Mapping (CCOM)/Joint Hydrographic Center (JHC), 2004. R. G. Cutter Jr., “Descriptions of seafloor roughness from sediment profile images”, Sediment Profile Imagery Colloquium of Experts (SPICE). Galway, Galway, Ireland, pp. 0-0, 2004. R. Doerner and Ware, C., “Visual Interactive Stimuli Techniques: Exploring Data Using Behavioral Animation”, Journal of Visual Languages and Computing, vol. 15. Elsevier, New York, NY, USA, pp. 161-181, 2004. P. Dartnell and Gardner, J. V., “Predicted Seafloor Facies of Central Santa Monica Bay, California”, U.S. Geological Survey (USGS), 2004. C. Ware, Information Visualization: Perception for Design, 2nd ed. Burlington, MA, USA: Morgan Kaufman, 2004, p. 435. J. V. Gardner, “Visualizing the Marine Geology off Southern California”, Geological Society of America (GSA). St. Andrews, New Brunswick, Canada, pp. 0-0, 2004. A. Zoksimovski and de Moustier, C., “Detection of Direct-path Arrivals for Multi-narrowband Sequences (3-30 kHz) in Shallow Water”, American Institute of Physics (AIP), vol. 728. La Jolla, CA, USA, pp. 478-488, 2004. N. Le, Pochec, P. R., and Ware, C., “Enhanced stereoscopic imaging”, International Association of Science and Technology for Development (IASTED). St. Andrews, New Brunswick, Canada, pp. 0-0, 2004. K. Hinckley, Jacob, R. K., and Ware, C., “Input/Output Devices and Interaction Techniques”, in The Computer Science and Engineering Handbook, 2nd ed., no. Chapman & Hall, CRC, Boca Raton, FL, USA: CRC Press, LLC, 2004. C. E. Parrish, “Using Lidar in Obstruction Chart Surveys”, Transportation Research Board (TRB) . Washington DC, Washington DC, USA, 2004. S. P. Gulick, Powell, R. D., Jaeger, J. M., Cowan, E. A., Mayer, L. A., Mix, A. C., Finney, B. P., Pisias, N. G., Prahl, F., and Stoner, J. S., “Glacial Advances and Retreats in Tectonic Southeast Alaska During the Little Ice Age and Last Glacial Maximum: Preliminary Results from EW0408”, EOS Transactions, American Geophysical Union . San Francisco, CA, USA, pp. 0-0, 2004. P. Dartnell and Gardner, J. V., “Predicting Seafloor Facies from Multibeam Bathymetry and Backscatter Data”, Photogrammetric Engineering and Remote Sensing, vol. 70. ASPRS: The Imaging and Geospatial Information Society, Bethesda, MD, USA, pp. 1081-1091, 2004. L. G. Ward, “Variations in physical properties and water quality in the Webhannet River Estuary (Wells National Estuarine Research Reserve, Maine)”, Journal of Coastal Research, vol. 45. Coastal Education & Research Foundation, Inc. [CERF], West Palm Beach, FL, USA, pp. 39-58, 2004. B. J. Kraft and de Moustier, C., “Variable Bandwidth Filter for Multibeam Echosounding Bottom Detection”, IEEE Oceans. Kobe, Kobe, Japan, pp. 1154-1158, 2004. D. S. Brogan and de Moustier, C., “Bathymetry and Seafloor Acoustic Backscatter Imagery with a Volume Search Sonar”, Journal of the Acoustical Society of America, vol. 115, pp. 0-1, 2004. G. R. Elston and Dijkstra, S. J., “Waveform characterization, clustering and segmentation of SHOALS”, Joint Airborne LIDAR Bathymetry Technical Center of Expertise Coastal Mapping and Charting Workshop (JALBTCX). St. Andrews, New Brunswick, Canada, pp. 0-0, 2004. R. G. Cutter Jr., “Benthic Habitat Characterization of the Lower Piscataqua River Estuary”, Capacity Development Workshop on Acoustic Techniques in Seabed Assessment (ATSA). St. Andrews, New Brunswick, Canada, pp. 0-0, 2004. G. R. Elston and Bell, J. M., “Pseudospectral time-domain modeling of non-Rayleigh reverberation: synthesis and statistical analysis of a sidescan sonar image of sand ripples”, IEEE Journal of Oceanic Engineering, vol. 29. IEEE, Washington DC, Washington DC, USA, pp. 317-329, 2004. P. Dartnell, Gardner, J. V., Mayer, L. A., and Hughes Clarke, J. E., “Los Angeles and San Diego Margin High-resolution Multibeam Bathymetry and Backscatter Data”, U.S. Geological Survey (USGS), 2004. S. Claesson, Huff, L. C., and Jakobsson, M., “Mapping Paleo-Coastlines and Cultural Resources in Boston Harbor, MA”, Society for American Archeology (SAA). Montreal, Quebec, Canada, pp. 0-0, 2004. L. A. Mayer, Jakobsson, M., and Armstrong, A. A., “Evaluating U.S. data holdings relevant to the definition of continental shelf limits”, in Legal and Scientific Aspects of Continental Shelf Limits, 8th ed., no. M.H Nordquist, J.N. Moore & T. Heider, Leiden, South Holland, The Netherlands: Martinus Nijhoff legacy_publishers, 2004, pp. 313-330. M. D. Plumlee, Arsenault, R., Brennan, R. T., and Ware, C., “The CCOM Chart of the Future Project: Maximizing Mariner Effectiveness Through Fusion of Marine & Visualization Technologies”, Marine Transportation System Research and Technology Coordination Conference. St. Andrews, New Brunswick, Canada, pp. 0-0, 2004. L. A. Mayer, Rzhanov, Y., Fornari, D. J., Soule, S. A., Shank, T. M., Beaulieu, S. E., Schouten, H., and Tivey, M., “Mosaicking Techniques for Deep Submergence Vehicle Video Imagery - Applications to Ridge2000 Science”, EOS Transactions, American Geophysical Union . San Francisco, CA, USA, pp. 0-0, 2004. K. Becker, Davis, E. E., Spiess, F. N., and de Moustier, C., “Temperature and Video Logs from the Upper Oceanic Crust, Holes 504B and 896A, Costa Rica Rift Flank: Implications for the Permeability of Upper Oceanic Crust”, Earth and Planetary Science Letters, vol. 222. Elsevier, New York, NY, USA, pp. 881-896, 2004. T. C. Weber, “Calibration of a Reson SeaBat 8101 Multibeam Echosounder”, Penn State University, 2004. C. de Moustier, Brogan, D. S., and Schimel, A. C. G., “Calibrated Seafloor Acoustic Backscatter Imagery with a 160 kHz Multibeam Sonar”, Journal of the Acoustical Society of America, vol. 116, pp. 0-2, 2004. J. V. Gardner, “The Marine Geology off Southern California”, Geological Society of America (GSA). St. Andrews, New Brunswick, Canada, pp. 0-0, 2004. S. J. Dijkstra and Elston, G. R., “Bottom Segmentation and Classification Using Expectation-maximization Clustering Methods on SHOALS Data”, American Society for Photogrammetry and Remote Sensing (ASPRS). Denver, CO, USA, pp. 0-0, 2004. C. Ware and Arsenault, R., “Frames of Reference in Virtual Object Rotation”, ACM SIGGRAPH Symposium on Applied Perception in Graphics and Visualization (APGV). San Diego, CA, USA, 2004. J. Miksis-Olds, Miller, J. H., and Tyack, P. L., “The Acoustics Environment of the Florida Manatee: Correlation of Noise and Level of Habitat Use”, Journal of the Acoustical Society of America, 2004. 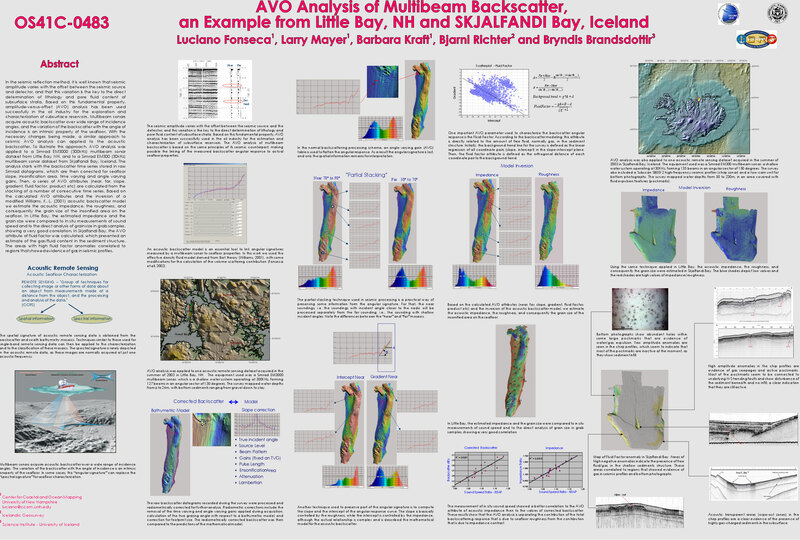 L. Fonseca, Mayer, L. A., Kraft, B. J., Brandsdottir, B., and Richter, B., “AVO Analysis of Multibeam Backscatter, an Example from Little Bay, NH and Skjalfandi Bay, Iceland”, EOS Transactions, American Geophysical Union . San Francisco, CA, USA, pp. 0-0, 2004. J. Miksis-Olds, Miller, J. H., Tyack, P. L., Reynolds, J. E., and Donaghay, P. L., “Differential Response by Manatees to Playbacks of Sounds Simulating Approaching Vessels”, Journal of the Acoustical Society of America, 2004. R. Komerska and Ware, C., “Haptic State-Surface Interactions”, IEEE Computer Graphics and Application, vol. 24. IEEE, Washington DC, Washington DC, USA, pp. 52-59, 2004. R. Arsenault and Ware, C., “The Importance of Stereo, Eye Coupled Perspective and Touch for Eye Hand Coordination”, Presence: Teleoperators and Virtual Environments, vol. 13. MIT Press, Cambridge, MA, USA, pp. 549-559, 2004. B. M. Sullivan, “Linking Audio and Visual Information while Navigating in a Virtual Reality Kiosk Display”, 2004. M. D. Plumlee, “Linking Focus and Context in 3D Multiscale Environments”, 2004. C. Ware and Bohannon, R. G., “Motion to Support Rapid Interactive Queries on Node-link Diagrams”, ACM Transactions on Applied Perception (TAP), vol. 1. Association for Computing Machinery (ACM), New York, NY, USA, pp. 1-15, 2004. D. S. Brogan, “Narrow-beam Monopulse Technique for Bathymetry and Seafloor Acoustic Backscatter Imagery with a Volume Search Sonar”, 2004. S. J. Dijkstra and Elston, G. R., “Quantitative Inter-channel Calibration of SHOALS Signals for Consistent Bottom Segmentation and Characterization”, American Society for Photogrammetry and Remote Sensing (ASPRS). Denver, CO, USA, pp. 0-0, 2004. J. A. Goff, Kraft, B. J., Mayer, L. A., Schock, S. G., Sommerfield, C. K., Olson, H. C., Gulick, S. P., and Nordfjord, S., “Seabed characterization on the New Jersey middle and outer shelf: Correlability and spatial variably of seafloor sediment properties”, Marine Geology, vol. 209. Elsevier, New York, NY, USA, pp. 147-172, 2004. I. Klaucke and Gardner, J. V., “Sedimentary processes of the lower Monterey Fan channel and channel-mouth lobe”, Marine Geology, vol. 206. pp. 181-198, 2004. R. Komerska and Ware, C., “A study of Linear Haptic and Pie Menus in a Fish Tank VR Environment”, International Symposium on Haptics Interfaces for Virtual Environments and Teleoperator Systems (HAPTICS). Chicago, IL, USA, pp. 224-231, 2004. R. G. Bohannon and Gardner, J. V., “Submarine landslides of San Pedro Sea Valley, southwest of Long Beach, California”, Marine Geology, vol. 203. Elsevier, New York, NY, USA, pp. 261-268, 2004. R. Arsenault, Ware, C., Plumlee, M. D., Martin, S. C., Whitcomb, L. L., Wiley, D. N., Gross, T., and Bilgili, A., “A System for Visualizing Time-varying Oceanographic 3D Data”, IEEE Oceans. Kobe, Kobe, Japan, pp. 0-5, 2004. A. Zoksimovski, “Underwater Communication Channel Characterization in the Southern California Off-shore Range”, 2004. J. V. Gardner, “U.S. Law of the Sea Cruise to Map the Foot of the Slope and 2500-m Isobath of the Northeast US Atlantic Continental Margin: Legs 1, 2 and 3. Cruise Report”, University of New Hampshire (UNH), Center for Coastal and Ocean Mapping (CCOM)/Joint Hydrographic Center (JHC), 2004. L. A. Mayer, “U.S. Law of the Sea Cruise to Map the Foot of the Slope and 2500-m Isobath of the U.S. Arctic Ocean Margin. Cruise Report for 2004”, University of New Hampshire (UNH), Center for Coastal and Ocean Mapping (CCOM)/Joint Hydrographic Center (JHC), 2004. C. Ware and Sweet, G., “View Direction, Surface Orientation and Texture Orientation for Perception of Surface Shape”, Graphics Interface (GI). London, London, UK, pp. 97-106, 2004. J. M. Bell and Elston, G. R., “Sonar Image Synthesis - techniques and applications”, Acoustics Bulletin, vol. 28. Institute of Acoustics, Sanford, Sanford, UK, pp. 24-29, 2003. R. E. Grizzle, Adams, J. R., Dijkstra, S. J., Smith, B., and Ward, R. W., Mapping and Characterizing Subtidal Oyster Reefs Using Acoustic Techniques, Underwater Videography and Quadrat Counts, no. P.W. Barnes & J.P. Thomas. Bethesda, MD, USA: American Fisheries Society, 2003. M. Jakobsson, Mayer, L. A., and Armstrong, A. A., “Analysis of Data Relevant to Extending a Coastal State's Continental Margin Under Law of the Sea Article 76”, International Hydrographic Review, vol. 4. Geomatics Information & Trading Center - GITC, Lemmers, Amsterdam, The Netherlands, pp. 2-18, 2003. J. V. Gardner, Morrison, J. R., and Ward, L. G., “The seafloor a key factor in lidar bottom detection”, IEEE Journal of Oceanic Engineering. IEEE, Washington DC, Washington DC, USA, 2003. M. Macnab and Jakobsson, M., “The International Bathymetric Chart of the Arctic Ocean (IBCAO): An Improved Morphological Framework for Oceanographic Investications”, EGS-AGU-AUG Joint Assembly. Nice, Nice, France, pp. 0-0, 2003. M. Jakobsson, Macnab, M., Grantz, A., and Kristoffersen, Y., “Hypsometry, Volume and Physiography of the Arctic Ocean and Their Paleoceanographic Implications”, EGS-AGU-AUG Joint Assembly. Nice, Nice, France, pp. 0-0, 2003. B. J. Kraft, Smith, S. M., Mayer, L. A., and Simpkin, P. G., “In-situ Measurement of Geoacoustic Sediment Properties: An Example from the ONR Mine Burial Program, Martha's Vineyard Coastal Observatory”, Journal of the Acoustical Society of America, vol. 113. Acoustical Society of America, Melville, NY, USA, pp. 0-0, 2003. P. Barnes, Fleisher, G., Gardner, J. V., and Lee, K., “Bathymetry and Selected Perspective Views of 6 Reef and Coastal Areas in Northern Lake Michigan”, U.S. Geological Survey (USGS), 2003. M. D. Plumlee and Ware, C., “Integrating Multiple 3D Views through Frame-of-reference Interaction”, Coordinated and Multiple Views in Exploratory Visualization (CMV). London, London, UK, pp. 34-43, 2003. P. Irani and Ware, C., “Diagramming Information Structures Using 3D Perceptual Primitives”, ACM Transactions on Computer-Human Interaction (CHI), vol. 10. Association for Computing Machinery (ACM), New York, NY, USA, pp. 1-19, 2003. G. R. Elston, “Lidar Waveform Characterization for Bottom Classification”, Annual Airborne Hydrography Workshop (AHW). Fort Lauderdale, FL, USA, pp. 0-0, 2003. M. Jakobsson, Siegert, M., and Paton, M., “The Grounding of an Ice Shelf in the Central Arctic Ocean: A Modeling Experiment”, International Conference on Arctic Margins (ICAM). Halifax, Nova Scotia, Canada, pp. 0-0, 2003. R. Arsenault and Ware, C., “The Importance of Stereo, Eye Coupled Perspective and Touch for Eye-Hand Coordination”, Presence: Teleoperators and Virtual Environments. MIT Press, Cambridge, MA, USA, pp. 0-0, 2003. Y. Rzhanov, Cutter Jr., R. G., and Mayer, L. A., “Seafloor Segmentation Based on Bathymetric Measurements from Multibeam Echosounders Data”, International Symposium on Signal Processing and Its Applications (SPIA). Paris, Paris, France, pp. 0-0, 2003. D. S. Sternlicht and de Moustier, C., “Time dependent seafloor acoustic backscatter (10-100kHz)”, Journal of the Acoustical Society of America, vol. 114. Acoustical Society of America, Melville, NY, USA, pp. 2709-2725, 2003. R. J. Diaz, Cutter Jr., R. G., and Dauer, D. M., “A Comparison of Two Methods for Estimating the Status of Benthic Habitat Quality in the Virginia Chesapeake Bay”, Journal of Experimental Marine Biology and Ecology, vol. 285. Elsevier, New York, NY, USA, pp. 371-381, 2003. H. J. Lee, Kayen, R. E., Gardner, J. V., and Locat, J., “Characteristics of Several Tsunamigenic Submarine Landslides”, in Submarine Mass Movements and Their Consequences: First International Symposium, no. J. Locat & J. Mienert, Amsterdam, North Holland, The Netherlands: Kluwer Academic, 2003, pp. 357-366. Y. Rzhanov, Mayer, L. A., Fornair, D., Shank, T. M., Humphris, S., Scheirer, D., Kinsey, J., and Whitcomb, L. L., “High-resolution Photo-mosaicing of the Rosebud Hydrothermal Vent Site and Surrounding Lava Flows, Galapagos Rift 86W: Techniques and Interpretation”, EOS Transactions, American Geophysical Union , vol. 84. San Francisco, CA, USA, pp. 0-0, 2003. G. Krinner, Mangerud, J., Jakobsson, M., Cruicifix, M., Ritz, C., Svendsen, J. I., and Genthon, C., “Impact of Ice-dammed Lakes on the Early Weichselian Climate of Northern Eurasia”, XVI INQUA Congress. Reno, NV, USA, pp. 0-0, 2003. S. M. Smith, “Navigation Surface Creation and Use for Charting Example - Seacoast New Hampshire”, U.S. Hydrographic Conference (US HYDRO). Biloxi, MS, USA, pp. 0-6, 2003. S. M. Smith, “The Navigation Surface: A Multipurpose Bathymetric Database”, 2003. M. Jakobsson, Siegert, M., and Paton, M., “A Modeling Experiment on the Grounding of an Ice Shelf in the Central Arctic Ocean During MIS 6”, EOS Transactions, American Geophysical Union , vol. 83. San Francisco, CA, USA, pp. 0-0, 2003. M. Jakobsson, Backman, J., Murray, A., and Lovlie, R., “Optically Stimulated Luminescence Dating Supports Central Arctic Ocean CM-scale Sedimentation Rates”, Geochemistry Geophysics Geosystems, vol. 4. American Geophysical Union , Washington DC, Washington DC, USA, pp. 0-11, 2003. L. C. Huff and Hou, T., “Processing Klein 5410 Data from Trawlex-01, Alaska Fisheries Science Center”, National Oceanic and Atmospheric Adminiatration (NOAA), National Ocean Service (NOS) / Office of Response and Restoration (ORR), 2003. L. C. Huff, Rzhanov, Y., Glang, G., Raymond, R., and Malik, M. A., “Maintaining Intra-line Details in a Multi-line DEM”, Shallow Water Survey Conference (SWS). St. Andrews, New Brunswick, Canada, pp. 0-0, 2003. J. Backman, Jakobsson, M., Lovlie, R., Polyak, L., and Febo, L. A., “Central Arctic Ocean Sedimentation: mm/ka-scale or cm/ka-scale Rates?”, XVI INQUA Congress. Reno, NV, USA, pp. 0-0, 2003. R. G. Cutter Jr., Rzhanov, Y., and Mayer, L. A., “Automated Segmentation of Seafloor Bathymetry from Multibeam Echosounder Data Using Local Fourier Histogram Texture Features”, Journal of Experimental Marine Biology and Ecology, vol. 285. Elsevier, New York, NY, USA, pp. 355-370, 2003. G. P. Schmal, Hickerson, E. L., Weaver, D. C., and Gardner, J. V., “High-resolution Multibeam Mapping and Habitat Characterization of Topographic Features in the Northwest Gulf of Mexico”, U.S. Hydrographic Conference (US HYDRO). Biloxi, MS, USA, pp. 0-0, 2003. J. Backman, Jakobsson, M., Lovlie, R., Polyak, L., and Febo, L. A., “Is the central Arctic Ocean a sediment-starved basin?”, Geophysical Research Abstracts (GRA), vol. 5. St. Andrews, New Brunswick, Canada, pp. 0-0, 2003. D. S. Sternlicht and de Moustier, C., “Remote sensing of sediment characteristics by optimized echo-envelope matching”, Journal of the Acoustical Society of America, vol. 114. Acoustical Society of America, Melville, NY, USA, pp. 2727-2743, 2003. L. G. Ward, Burdicki, D. M., and Adams, J. R., “Preliminary Studies of the Impact of Sea Level Rise on Coastal Environments (New Hampshire, USA)”, International Conference on Coastal Sediments (ICCS). Clearwater Beach, FL, USA, pp. 0-13, 2003. M. Jakobsson, Grantz, A., Kristoffersen, Y., and Macnab, M., “Bathymetry and Physiography of the Arctic Ocean and Its Constituent Seas”, in Arctic Ocean Organic Carbon Cycle: Present and Past, no. R. Stein & R.W. Macdonald, New York, NY, USA: Springer Publisher, 2003. T. C. Gallaudet and de Moustier, C., “High-Frequency Volume and Boundary Acoustic Backscatter Fluctuations in Shallow Water”, Journal of the Acoustical Society of America, vol. 114. Acoustical Society of America, Melville, NY, USA, pp. 707-725, 2003. R. Lovlie, Jakobsson, M., and Backman, J., “Paleomagnetic Chronology of Arctic Ocean Sediment Cores: Reversals and Excursions -The Conundrum”, EGS-AGU-AUG Joint Assembly. Nice, Nice, France, pp. 0-0, 2003. C. Ware, “Design as Applied Perception”, in HCI Models, Theories and Frameworks, no. J. Carroll, Burlington, MA, USA: Morgan Kaufman, 2003, pp. 10-26. M. Jakobsson, Grantz, A., Kristoffersen, Y., and Macnab, M., “Physiographic Provinces of the Arctic Ocean Seafloor”, Geological Society of America Bulletin (GSAB), vol. 115. The Geological Society of America (GSA), pp. 1443-1455, 2003. D. W. Ramsey, Dartnell, P., Bacon, C. R., Robinson, J. E., and Gardner, J. V., “Crater Lake Revealed - Investigations I-2790”, U.S. Geological Survey (USGS), 2003. R. Komerska and Ware, C., “Haptic Task Constraints for 3D Interaction”, IEEE Virtual Reality-Haptics Symposium (VR-Haptics). Los Angeles, CA, USA, pp. 270-277, 2003. C. F. Lewis, Blasco, S. M., Forsyth, D. A., Mayer, L. A., Dijkstra, S. J., Jacobi, R. D., Todd, B. J., Coakley, J. P., and King, J. W., “Do Quaternary Sediments Register Paleoseismicity or Neotectonic Rejuvenation of Ancient Faults Beneath Lake Ontario?”, Geological Society of America (GSA). Halifax, Nova Scotia, Canada, pp. 0-0, 2003. R. J. Diaz, Cutter Jr., R. G., and Able, K. W., “The Importance of Physical and Biogenic Structure to Juvenile Fishes on the Shallow Inner Continental Shelf”, Estuaries, vol. 26. The Estuarine Research Federation, pp. 12-20, 2003. P. Dartnell, Gardner, J. V., Hughes Clarke, J. E., and Mayer, L. A., “Bathymetry and Acoustic Backscatter of the Mid and Outer Continental Shelf, Head of De Soto Canyon, Northeastern Gulf of Mexico Data, Images, and GIS”, U.S. Geological Survey (USGS), 2003. C. de Moustier and Gallaudet, T. C., “Detection of Sonar Induced Measurement Uncertainties in Environment Sensing: A Case Study with the Torodial Volume Search Sonar”, in Impact of Littoral Environmental Variability on Acoustic Predictions and Sonar Performance, Dordrecht, Dordrecht, The Netherlands: Kluwer Press, 2003, pp. 571-577. M. D. Plumlee and Ware, C., “An Evaluation of Methods for Linking 3D Views”, ACM SIGGRAPH Symposium on Interactive 3D Graphics (I3D). Monterey, CA, USA, pp. 193-201, 2003. R. Arsenault, Smith, S. M., Ware, C., Mayer, L. A., and Plumlee, M. D., “Fusing Information in a 3D Chart of the Future Display”, U.S. Hydrographic Conference (US HYDRO). Biloxi, MS, USA, pp. 0-7, 2003. R. Arsenault, Plumlee, M. D., Smith, S. M., Ware, C., Brennan, R. T., and Mayer, L. A., “Fusing Information in a 3D Chart-of-the-Future Display”, U.S. Hydrographic Conference (US HYDRO). The Hydrographic Society of America, Biloxi, MS, 2003. J. V. Gardner, Dartnell, P., Mayer, L. A., and Hughes Clarke, J. E., “Geomorphology acoustic backscatter and processes in Santa Monica Bay from multibeam mapping”, Marine Environmental Research, vol. 56. Elsevier, New York, NY, USA, pp. 15-46, 2003. R. Komerska and Ware, C., “Haptic-GeoZui3D: Exploring the Use of Haptics in AUV Path Planning”, Unmanned Untethered Submersible Technology Symposium (UUST). Durham, NH, USA, pp. 0-9, 2003. R. Komerska, Ware, C., Plumlee, M. D., and Arsenault, R., “Haptic-GeoZui3D: Exploring the Use of Haptics in AUV Path Planning”, Unmanned Untethered Submersible Technology Symposium (UUST). Autonomous Undersea Systems Institute , Durham, NH, 2003. L. Bartram, Ware, C., and Calvert, T., “Moticons: Detection, Distraction and Task”, International Journal of Human-Computer Studies, vol. 58. Elsevier, New York, NY, USA, pp. 515-545, 2003. J. V. Gardner, “Report on the LOTS Cruise to Map Foot of the Slope and 2500-m Isobath of Bowers Ridge and Beringian Margin, Bering Sea. Cruise Report”, University of New Hampshire (UNH), Center for Coastal and Ocean Mapping (CCOM)/Joint Hydrographic Center (JHC), 2003. J. Miksis-Olds and Miller, J. H., “Using Parabolic Equations to Model Sound Propagation in Manatee Habitats”, European Cetacean Society 2003. European Cetacean Society, Las Palmas de Gran Canaria, Spain, 2003. L. A. Mayer, Raymond, R., Glang, G., and Huff, L. C., “Resolving the Ripples (and a Mine): High-Resolution Multibeam Survey of Martha's Vineyard ONR Mine Burial Program Field Area”, EOS Transactions, American Geophysical Union , vol. 83. San Francisco, CA, USA, pp. 0-0, 2002. S. J. Dijkstra and Grizzle, R. E., “Automated Interpretation of Sidescan and Single-beam Sonar for Characterization and Mapping the Extent of Subtidal Oyster Reefs”, National Shellfisheries Association (NSA). Mystic, CT, USA, pp. 0-0, 2002.